Imports, which we’ve talked about before, are not only flooding the market and increasing supply, they’re also coming into the U.S. to be sold at extremely low prices – prices that domestic producers cannot compete with. Currently, there’s a global surplus capacity of 600 million tons of steel. This surplus continues to grow even after several U.S. steel producers cut back production, idled plants and implemented company-wide layoffs. On a global level, China, the world’s largest producer and consumer of steel, is also experiencing a decline in steel use and demand. 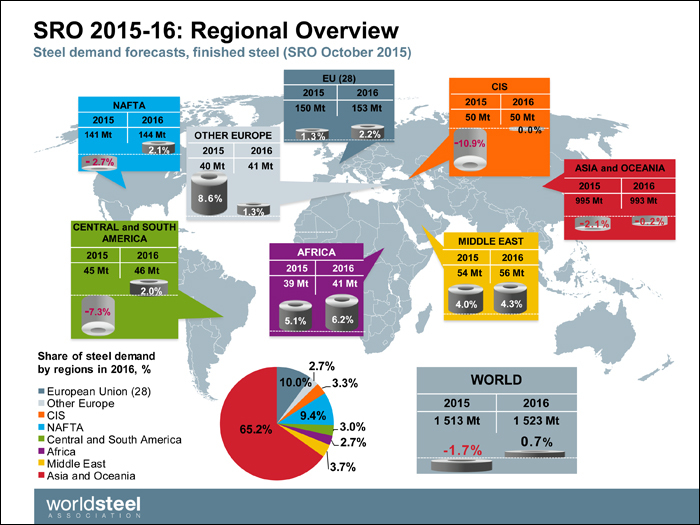 In the midst of decreasing demand, the worldsteel association is forecasting a 0.7% growth in global demand for 2016. Although demand for steel in the U.S. is relatively decent, demand is being overshadowed by supply. An excess supply that’s even greater given the influx of illegally imported and unfairly traded products in the country, among other factors. A time-old tale at this point, imports continue to create price wars for domestic companies who are attempting to battle import products. A price war domestic companies rarely win; foreign steel is coming into the country and is being sold at a price that’s lower than the cost of production for domestic companies. In addition to the steel market being flooded with imports and unfairly traded products, the energy sector is also experiencing its fair share of hardships, further contributing to the steel surplus. The energy sector accounts for 10% of steel consumption in the U.S. Given the current state of the OCTG industry, demand in this sector has decreased colossally. With oil prices being as low as they are, rig counts decreasing, and the millions of dollars of OCTG inventory (about 10 to 12 months’ worth) sitting on the ground, the energy sector is contributing to the decreased in steel demand, while also experiencing its own fall from greatness. During the past year, the oil and gas industry has continued to fight imports, like the rest of the steel industry, while also battling the fall of oils prices from over $100/barrel to under $45/barrel. And while many companies managed to stay in the game for some time, since October 2014, 19 oil and gas companies have filed for bankruptcy. As we patiently wait for the market to turn around, and we don’t see this happening until the second half of 2016, oil and gas companies have to figure out a way to streamline processes to be as lean and efficient as possible. Here at JMC Steel Group and Energex Tube – our OCTG and line pipe division – we’re committed to helping our distributor partners weather the uncertainty of the current market. Through an improved inventory management program, we want to be a strategic partner for our customers, helping them save valuable cash and decrease the amount of inventory they have to carry. Another industry that directly impacts steel consumption and demand is non-residential construction. Throughout the past year or so, the non-residential construction sector has continued grow, even if it’s at a slightly slower pace than 2014. According to data from the U.S. Bureau of the Census, total construction spending in the non-residential sector has been on the rise. While spending isn’t what it was at its peak in October 2008, it’s at the highest it’s been since April 2009. 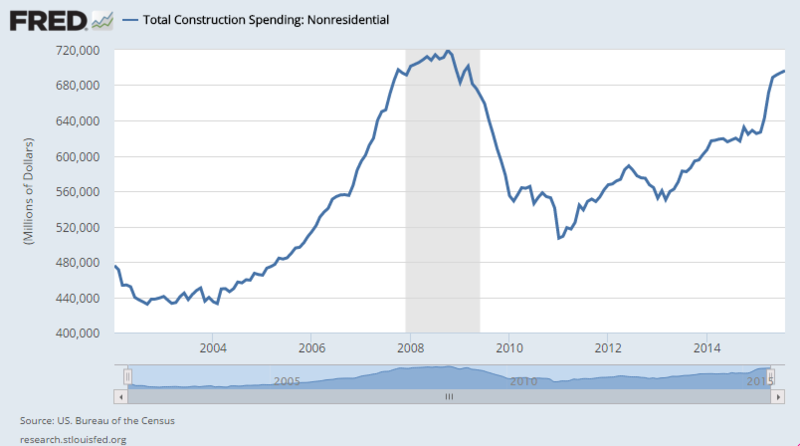 August 2015 (the latest for which we have spending data) marked the seventh consecutive month of non-residential construction spending increases. Compared to August 2014, spending has increased 12.3%. While non-residential construction spending is on the rise, over the past several months, the number of construction starts in the non-residential sector has been on a decline. 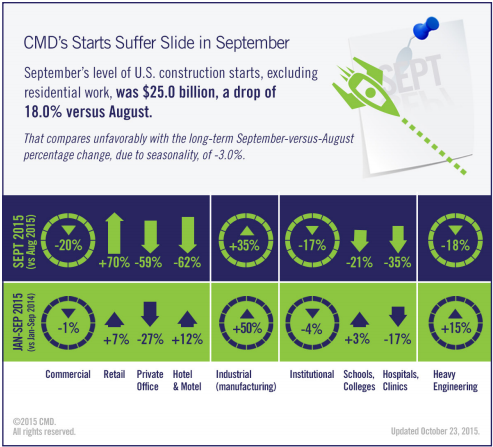 In a report from CMD, September’s construction starts fell 18% compared to August 2015, totaling a $25 billion decrease. Manufacturing and retail both saw significant increases in starts, whereas commercial, institutional, healthcare and private office all saw decreases in starts. For the construction industry, the winter months have traditionally seen a decrease in spending and construction starts due to weather, so it’s likely we will continue to see a decline in starts (especially in the Northeast) through the beginning of 2016. Despite the decline in starts, the outlook over the next five years is positive for construction growth. Residential construction will continue to be the largest market; however, the push for renewable energy will have a positive impact on energy and utility construction. Commercial construction, along with government investment in tourism, and office and retail building construction is also forecasted to experience growth. For the steel industry, this growth could prove to be just what we need to increase consumption and demand. However, it’s likely that the fight against import products will continue to be a thorn in our side. What will continue to help set domestic products apart from import products are quality and domestic manufacturers’ ability to provide solutions that will help enhance their customers’ business in the most efficient way possible. What do you think? How can steel manufacturers and producers continue to stay competitive in a surplus market flooded with imports and low demand? Share your thoughts in the comments below.